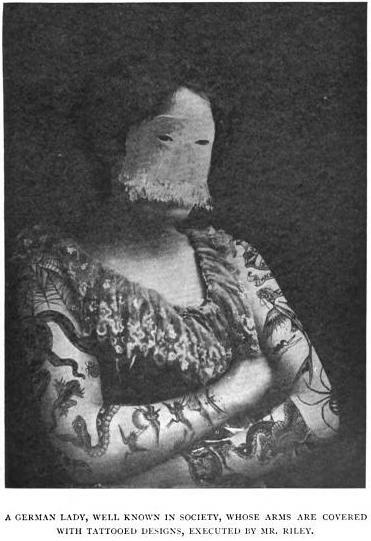 Another craze shared by both ladies and gentlemen alike during the Edwardian era were tattoos. Sparked by the Prince of Wales being inked on a visit to Jerusalem in 1862, the trend reached its height in the 1890s, when a foreign paper remarked upon the craze in “which even gentlemen are having done on the less exposed parts of their bodies” (Corriere della Sera, Milan, April 5, 1901). The go-to tattoo artist of the era was Mr. Tom Riley, who set up shop at the Earl’s Court Exhibitions, where he had quarters in the Western Arcades. In 1891, he and his American-based cousin S.F. 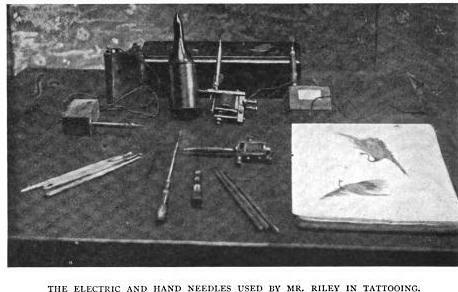 O’Riley shared the patent on a tattoo needle. The needles worked like an electric bell and stylographic pen, and it was moved by a vibrating strip of metal in a similar way to the hammer of an electric bell. The needle itself worked up and down in a hollow spindle, from the end of which protruded every time the vibrating bar in the head of the machine moving up and down. The speed at which the vibrating bar moved was as nearly 1800 times a minute, so that the needle made about thirty distinct punctures in the skin every second. The hand needles used for “filling in” were made up of from two to eight to ten needles fastened together at the end of the a small wood or bone handle somewhat resembling a pen holder in size and shape. Ladies had their lips and cheeks tattooed with color as well as regular tattoos. 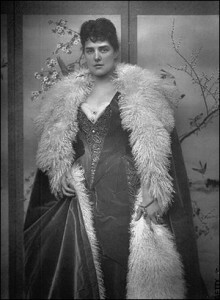 Accordingly, Lady Randolph Churchill (nee Jennie Jerome of Brooklyn, NY) was rumored to have a tattoo of a small snake winding around one of her wrists, and the scandalous Princess de Caraman-Chimay sported tattoos up and down both arms. Besides King Edward VII, known royalties with tattoos were the Duke of Saxe-Coburg, Prince George of Greece and Edward’s son, who reigned as George V.
Visit the Tattoo History Source, or read articles here and here for further information on Edwardian tattooing. I had the quote for a while, but it wasn’t until I was browsing Google Books that I found its source: “The English Mechanic and World of Science”! Interesting post. Anne Sebba however claims in her new biography that the story of Jennie Jerome Churchill having a tattoo was just a rumor, like the one that they had Iroquois Indian blood. I did read that, but, who knows! All other media I’ve read which mentions Lady Randolph references a tattoo.